To accommodate the installation of a new public art sculpture within the Palm Avenue/Cocoanut Avenue roundabout, the northwest quadrant of the roundabout will be closed on Saturday, Feb. 2, from approximately 6:45 to 10 a.m., the City of Sarasota has announced. The installation is anticipated to begin around 8 a.m., a news release notes. The road will reopen as soon as the installation has been completed. Created by Indiana and part-time Southwest Florida resident and artist Jeffrey Laramore, the colorful sculpture Jumping Fish will stand 16 feet tall, the release explains. 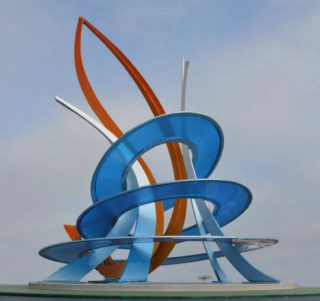 “A cr­ane will be used to hoist the piece into the center of the roundabout,” the release adds. In December 2017, the City Commission approved the fabrication of Jumping Fish, allocating $150,000 in public art funds to the project. “To enhance aesthetics and a sense of place, public art is installed within the center of new roundabouts located in the city limits,” the release explains. Two Calls to Artists are open for sculptures to be placed within two roundabouts under construction: 10th Street/U.S. 41 and 14th Street/U.S. 41, the release notes. To minimize traffic impacts, city staff planned the installation of Jumping Fish to occur during non-peak travel hours, the release adds.